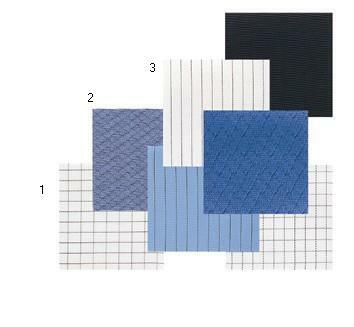 The range of anti-static fabric are available in different construction for various applications. 100% polyester lint free material with checked carbon yarns for excellent conductivity. Available in sky blue, dark blue, white, pink and green. Polyester cotton for maximum protection against ESD charges. The diamond grid helps to dissipate static charges generated effectively. Available in dark blue, white. 100% polyester lint free material for critical environment.The vertical carbon yarns helps effective dissipation of static charges.